Can a tank or mech capture or mobilize 2 neutrals that lean to your side? Example nw Persia and eastern Persia. Or does a unit need to stop in a neutral to mobile and capture the money? To simplify the rule for any new players that read this; you cannot blitz through a friendly neutral I.E. they stop once they enter. We are not talking about “blitzing” here, as “blitzing” is a combat move, involving hostile territories. Moving into a friendly neutral territory takes place during Noncombat Move Phase. This is a noncombat move that is further restricted by the above quoted rule. 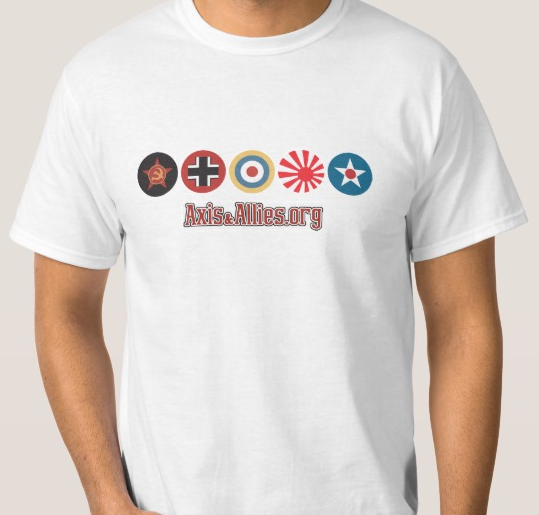 Where 2 buy Axis/Allies stuff? maybe you can find adequate stuff here: i live in europe as well and once i ordered some chips only…cost less then 50 $. there had been no harassment like special taxes etc. i think for small pieces like tokens you won´t have to pay any tax. rock on! I tend to leave Greece for Italy and make Germany take Bulgaria and Yugo based on historical value. Now has anyone ever seen UK take Greece if you choose to leave it for Italy? I have never seen this because I am sure UK thinks taking Greece will weaken its position in Med. Any thoughts on this? We played with dice, not low luck. Is there a Pacific map like this? @tytyboogie: thanx Mclovin…i was just thinking the same thing that the 2nd edition game i have just chilling in the closet would be a great choice to paint some neutral armies with…blue for allies?what shade of blue if france is already blue? red sounds great for axis actually…i noticed grey being used for strict neutrals as well. mclovin " Actually all the neutrals I just used the 1986 second edition infantry. Just mixed up different countries and painted them white, then the flags on the roundels. Not zoomed in 500x they actually don’t look too bad I’m using second edition pieces for the Pro-Allied/Axis as well, Allied will be all blue, Axis all red. Same thing with the flag painted on the roundel." I used a really dark blue for the Pro-Allied, so there isn’t any confusion with the French pieces. Red seemed to fit the Axis. @AllyAxis: @orania: There is a major IC in Paris. This isnt possible with A2 rules. Captured Major IC turn into a small one. Really. I didn’t see that one in the rules I downloaded. No Majors in non native territory can be built. but France falls to a minor? Didn’t see that one at all. Holy crap your right. I guess it only mattered for France since Britian did not fall or russia. Not sure if we placed that many forces there anyway. Because the Germans did not build that many forces there throughout the game. The italians moved troops in, well maybe before berlin fell late in the game the Axis player on turn 9 may have built more forces there, but largely he used the Italians to defend western Europe and built germans in West germany to defend Denmark. Ultimately I don’t think it impacted our game or its outcome, but will note that for the future!!! how is that good for germany to see bombers take out his naval? you get like 1 or 2 drops in before usa slams it… that sets you back from the VC win… with the naval and air lost there and the cost of the airbase is enough mech to just have shoved down there anyway. Not to mention bombers take 1 round to get in position then it hits… it is the fastest way for USA to have an impact. bombers hitting stuff is fast and furious in an otherwise slow process. there is no infrastructure required for bombers either. you just buy one beer and GO, epic winning, it is bi winning. who needs to drop men to trade ipcs with germany/italy? when you can just blast their stuff in the ocean? Romania minor is ok for ground units. the naval and airbase is not going to pay for itself. how many rounds can you get swinging at russia with just carrier 2 transports? and say you pull your air back before the bombers hit? I’ll give you round 1 place romania round 2 drop the 3 naval pieces (30 ipc and + airbase cost which is not really lost and has somewhat a tactical advantage from there… but it can be bombed later). Anyway caucasus is worth 7 so you would need a good 4 rounds of drops to pay for itself in theory. trying to defend it is a dumb idea, you’ll typically lose even more out of it and it stalls you from taking russia and reduces threat levels from axis on sz 97. not to mention bombers are up there in optimal buys for USA anyway. they do lots of things and can switch fronts pretty fast. plus if you shove 7 bombers at 2 tanks, you break even in terms of IPC (1 bomber for 2 tank). Giving usa a reason to give russia the ability to call in an airstrike on whatever he could not get to… iz not like a good outcome for axis. It is like call of duty man, spetnaz will air strike the flag and cap it. Allies get gangsta like that when you throw naval down in the black sea. Trust me, someone did this to me and bombers own. In all fairness I like having some bombers around… mmm munch that naval. usually bombers are a part of my opener because usually people like to sea lion feint… if they do go through with sea lion I can at least rest assure that japan won’t declare war or 4 bombers fly into uk. Before 3.9 bombers just increased the casualties of germany in taking uk, now it just too much fodder for germany so it actually delays japan if germany wants to go through with it. if I see a romania IC early on and no naval buy in the baltic… I’ll only have a couple bombers. if naval is bought in the baltic I’ll still get 3 bombers and a couple dds and a carrier. It’s the typical reaction from usa. bombers can hit naval up top and land in belarus. 3 bombers layin around is never bad either it can hit an italian fleet that moves out. or industrial bomb an airbase before uk attacks italy fleet so no scramble. or bombers can just strafe italian guys between algeria and egypt… so all russia has to do is blitz a tank through tobruk and that other spot for +7 russia. bombers are good units to have for usa. I don’t see how they are bad. Russia’s NO has changed so that bombers are more optimal to have so you can just blast all that stuff and clear it out for russia if there is nothing better for them to do.